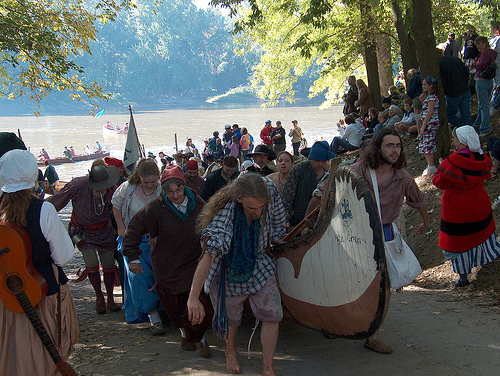 September 24-25, 2011 — The most widely known festival held in Greater Lafayette is most likely the annual Feast of the Hunter’s Moon, a re-creation of an 18th Century French and Indian trading post on the banks of the Wabash River. Eighteenth century music, crafts, dance and life ways of the outpost’s original inhabitants are recreated each year. In addition to craft demonstrations and military re-enactments, the Feast features more than 40 different recreated period foods, including buffalo, Scottish meat pies and pork chops. The Feast gets its name from the lunar cycles of the Miami Indian calendar and is scheduled each to coincide with the proper phase of the moon. The Feast is held on the grounds of Fort Ouiatenon, the site of the first European settlement in Indiana. Fort Ouiatenon was built in 1717 and burned to the ground in 1791. Seven different arenas and stages plus numerous locations on the 30 acres of festival grounds feature outstanding performances by musicians, interpreters, military re-enactors and Native American groups. Activities for children include candle-dipping, butter churning, costume try-on, bead crafts and an area where children learn to trade goods like their 18th century counterparts did. Advance single day tickets are $25.00 per family (2 adults and up to 4 children), $10.00 for adults, and $5.00 for children ages 4-16. Children under the age of 4 are free. Tickets may be ordered online beginning July 1st, 2011 at http://www.tippecanoehistory.org or can be purchased at various retail outlets in the Greater Lafayette area including Marsh Supermarkets, Regions Bank, PEFCU, Farmers State Bank, Lafayette Bank and Trust and all Tippecanoe County Historical Association sites. Remember to make your hotel reservations for the Feast early. In Greater Lafayette, summer doesn’t really seem to begin until the Taste of Tippecanoe. Presented every June by the Tippecanoe Arts Federation and held right in the heart of downtown Lafayette-West Lafayette at Riehle Plaza and the Big Four Depot, on the John T. Myers Pedestrian Bridge, and at Tapawingo Park in West Lafayette. The “Taste” is a one day, multi-stage festival that draws more than 50,000 people and features a smorgasbord of local restaurants, live music, and ends with a spectacular fireworks show for kids of all ages. The Taste of Tippecanoe is the primary fundraiser for the Tippecanoe Arts Federation. The 2011 Taste of Tippecanoe is scheduled for Saturday, June 18th, 2011 from 4p-Midnight. Every year, Greater Lafayette plays host to the Indiana Fiddlers’ Gathering. This regional festival at the Tippecanoe Battlefield is a three-days of acoustic music featuring the best in old-time, bluegrass, swing jazz fiddle, string band, Celtic and ethnic music on one stage. Presented by Indiana Fiddlers’ Gathering, Inc., the festival draws up to 10,000 people annually to hear the best in traditional music. Past performers have included John Hartford, Alison Krauss & Union Station, Johnny Gimble, John McCutcheon, Mike Seeger, Tom Paley, Chris Thile & Nickel Creek, Robin & Linda Williams, Carry Newcomer, Howard Armstrong, Johnny Frigo, Claude Williams, Jethro Burns, and Rocky Stone among others. The most recent addition to Greater Lafayette’s festival calendar is the Lay Flats Arts and Music Festival. Launched in 2007, this annual outdoor music and arts festival held at the Tippecanoe Outdoor Ampitheatre in West Lafayette features several genres of music including garage rock, alternative rock, country, bluegrass, folk, hip hop, and electronica set across three stages and tents. In addition to the music, artists exhibit mixed media, paintings, sculptures, photography, blown glass, hand made jewelry, etc. Interactive workshops and art installations for children and adults include creative writing, traditional musical instruments, as well as the construction of the main stage backdrop during the day. Proceeds from the event support local charities and benefit children’s art therapy, outreach and support programs in Greater Lafayette.